Heat oven to 350°F. Grease or spray two 8-inch round pans; place 8-inch round piece of cooking parchment paper in bottom of each pan. Grease or spray parchment paper. In large bowl, beat 1 box cake mix and ingredients called for on box with electric mixer on low speed 30 seconds, then on high speed about 2 minutes or until smooth. Spread in pans. Bake as directed on box. Cool 10 minutes; run knife around sides of pans to loosen cakes. Gently remove from pans to cooling rack; remove parchment paper. Cool completely, about 30 minutes. Repeat to make 2 more layers. Flatten cake layers by trimming off rounded tops. In 2 layers, cut small round out of center, using 4-inch round cutter. To assemble cake: Place 1 uncut cake layer on cake stand or serving platter; spread 1/3 cup frosting on top. Top with 1 layer with center removed; spread 1/3 cup frosting on top. Top with second layer with center removed; spread 1/3 cup frosting on top. Fill cake with candies and candy sprinkles. Gently press candies to level, top with full cake layer. Frost side and top of cake using remaining frosting. Store loosely covered in refrigerator. Don’t have a 4-inch round cutter? Cut out a 4-inch circle of cooking parchment paper, and use it as a pattern. 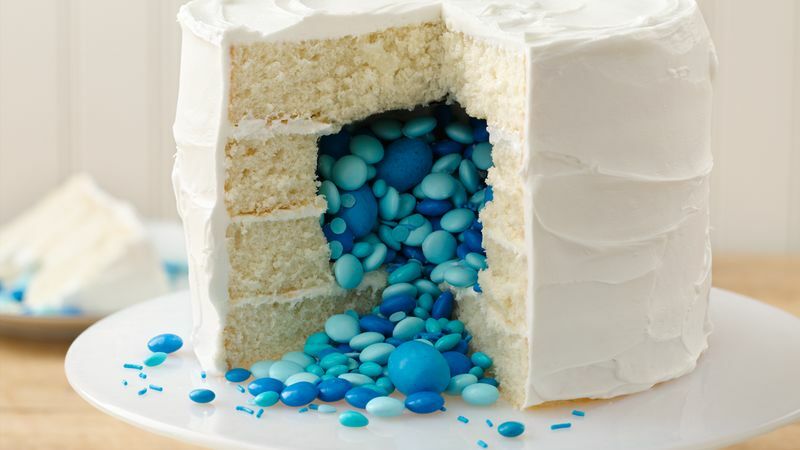 This cake is filled with blue candies to represent a boy but to reveal that you are expecting a girl, simply fill the cake with pink candies.